Initial consultations take place in the Palmer Room, which is named after the discoverer of chiropractic, D.D. Palmer. Usually, on your first visit to the office, you will greeted warmly by one of our 5 star Chiropractic Assistants. 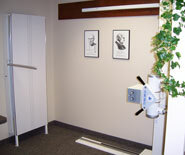 You will be led to our Consultation Room to complete some initial paperwork. This paperwork can actually be done ahead of time by clicking on the “New Patient Paperwork” icon on the Home Page of this site. The information gathered in the paperwork will help the doctor to focus their questions during consultation and will give him or her insight into your overall health. You will be given a brief tour of the office and will be shown a quick informational video so that you know what to expect at your appointment. The doctor will talk with you about your health concerns. They will take a detailed history of your health issues to help determine if yours is a chiropractic case. Next, you will have a complete exam that will include special tests. These tests help determine where your problem areas might be and how the doctor will address them. The tests are as follows: static palpation, which is simply feeling the bones in your spine for tenderness, swelling and abnormalities; motion palpation, which is simply bending your spine to look for signs of fixation; instrumentation, which involves running a nervoscope down your spine to locate areas of swelling. The nervoscope feels like two fingers gliding down your spine. It detects heat, which is an indication of swelling. These tests, in addition to others, help the doctor determine if yours is a chiropractic case…and if he or she can help you. Then, if necessary, weight-bearing (standing) x-rays will be taken. X-rays are taken for several reasons: to determine the condition of the discs (the cushions between the vertebrae in your spine); to determine the phases of degeneration; to locate potential problem areas, misalignments and to rule out other pathologies (disease). 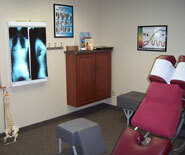 Our clinic recently upgraded to digital x-rays to provide an enhanced evaluation of the body. After the x-rays, depending on what is found during the exam and x-ray process, the doctor will make a determination whether or not to provide treatment to you on your first visit. He or she will also refer you to other healthcare providers if appropriate. The first appointment usually takes about an hour.